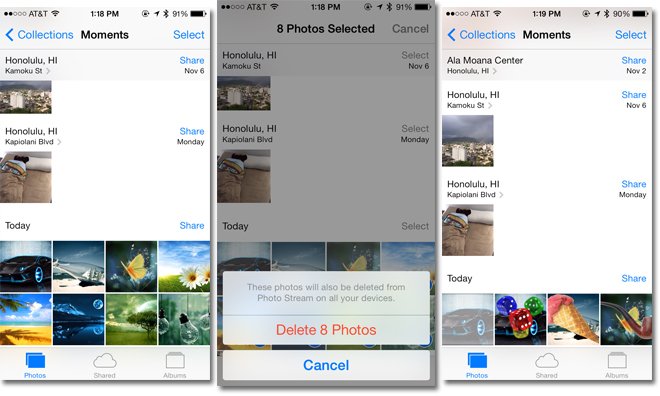 Despite being discovered in iOS 5 last year, a possible caching bug in Apple's iOS 7 Photos app still allows thumbnails of deleted pictures to be "resurrected" by saving a transparent PNG file to the album. The thumbnail restoration issue as applicable to the latest iOS 7.0.4 was spotted by AppleInsider reader Mike, while a quick check confirms that the small previews associated with deleted pictures do indeed reappear when a transparent image is saved to the Camera Roll. Full size pictures are not restored. One of the first mentions of the Photos app bug appeared in Apple's Support Communities forum in early 2012, with the thread creator stating they were able to "resurrect" photos deleted some months prior by saving an image with a transparent background to their photo album. A closer inspection of the issue revealed that only image previews, or small thumbnails, were being restored, suggesting the problem was related to an iOS local caching mechanism. By viewing iOS system files via third-party software, thumbnail files appear in the Photo Data folder even after their associated pictures are deleted. Erasing these files will clear the problem, though the solution is temporary as the system will start saving thumbnails in the same problematic manner once a new photo is taken. For many, the apparent bug is likely a non-issue, though some users may be concerned about potential security and privacy implications. For example, if a nefarious party were to gain access to an unlocked iOS device, they could potentially restore old deleted thumbnails by saving a transparent PNG file readily available on the Internet. It is not clear why Apple has left the the possible security hole unpatched, though the company told Mike that iOS engineers would be informed of the issue.